Robert Reed said he felt he would be close to Heaven and his late wife. 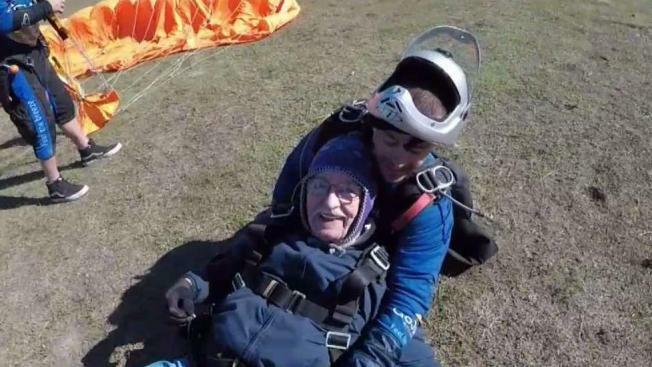 Robert E. Reed has been talking about jumping out of an airplane for years, and his 90th birthday seemed like as good a time as any. Dozens of family and friends, including Reed’s grandsons, Mark and Matt; his sons Tom, Bob and Steve; the family who owns one of his favorite cafes in Vista, California, and even his doctor’s family; who decided to make the jump with him at GoJump Oceanside Saturday. “I didn’t really think we’d go skydiving, but he made it to 90 and we’re going to do it,” his granddaughter Alyssa said nervously. Reed said he was inspired to jump by a former president. “I figured if George Bush can do it by golly I can do it,” he told NBC 7. Reed also has another reason for jumping. His wife passed away last year. “I feel I’m closer to Heaven near my wife,” he said. “She would have jumped with me.” Around his neck, he wears his wife’s wedding ring, a red ring symbolizing 70 years of marriage and a cross. He has worn them since the day his wife died. “I’ll wear them for the rest of my life, as long as I live,” he said. Having roped in nervous family members and friends who thought the day would never come when he first asked them to jump with him years ago, Reed seemed like the most excited in the group. His granddaughter said she doesn’t even like to fly. Reed, who has never skydived, said he briefly considered joining the paratroopers during World War II when he was in basic training but decided against it. His daughter Karen, who decided not to jump, started planning the event about two months ago. “We just want to make everything special for him since we lost my mother a year ago,” she said. “He would like to be with her right now, but we’re not letting him go yet." Reed officially turns 90 on Monday. "Today's the jump, tomorrow’s the party and Monday’s my birthday," he explained. Reed’s doctor, Jeffrey Newman, said when Reed asked him 10 years ago to jump with him for his 90th birthday, he didn’t think it would ever happen.